The CPAP full face mask is useful if you breathe through your mouth or your breathing alternates regularly between your nose and mouth. Full face CPAP masks cover both the mouth and the nose. They are prescribed especially if you are a mouth breather. So, if you do think you are a mouth breather and don't think you can train yourself to breathe only through your nose, or if you often have a congested nose and must breathe through your mouth, you might want to consider a full face CPAP mask (one that covers nose and mouth). Full face masks seem to be harder to get to fit properly and to seal than nasal masks, that's a potential drawback, but not very difficult in most cases. To help you get an easier therapy, in this page you'll learn how to properly fit different types of CPAP full face masks. Why is so important to wear a CPAP full face mask when you breathe through your mouth? Well, the answer is simple: when you sleep with a nasal mask, but you breathe with your mouth open, the pressure from your CPAP escapes through the mouth. If this happens, the therapy with CPAP becomes ineffective as the pressure intended to hold your airway open flows out through your mouth. 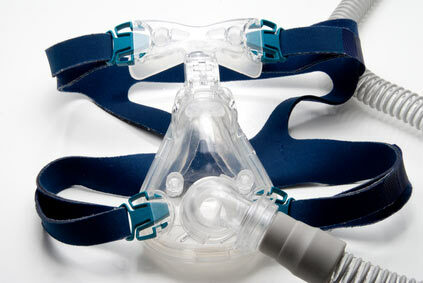 A CPAP full face mask prevents the air to escape, so the sleep apnea therapy is not affected by mouth leaks. A full face mask has a triangular shape. It seals around both the nose and mouth, and is held in place with headgear. The mask also contains a hard plastic frame which keeps a softer inner cushion in place. This cuhion lies against the face and has an important role in maintaining a good seal and comfort. The mask also has a head gear which consists of straps and sometimes a forehead brace. According to the reimbursement schedule from the Center for Medicare and Medicaid Services, CPAP full face mask cushions can be replaced every 30 days, but a complete full face mask with headgear should be replaced every 6 months. The function of CPAP face mask is to equalize the pressure between the nose and mouth, allowing you to receive the proper treatment pressure every time you wear it. 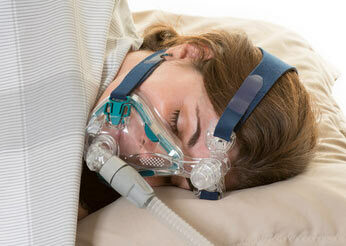 Resmed Quattro is one of the most famous full face masks among the CPAP users. This mask offers an effective treatment, even if you breathe through your mouth. the forehead support comes with 24 positions, offering a better fit to a wider range of people. it's improved dual cushion technology provides a better seal and comfort. it's easy to assemble and disasemble, which is important when you have to clean the mask. it's much quieter than previous masks due to improved vent system. Click here to Buy Resmed Quattro Face Mask. The Ultra Mirage mask is a great solution if you have frequent nasal congestion or it can be useful to have on hand in case you catch a cold or have bothersome allergies. This mask also uses a dual cushion which is an improved design and material that will help for a better seal and it will increase the comfort during sleep. Lay down in your bed with your head on your pillow in your normal sleeping position. Then and only then, gently tighten the straps JUST UNTIL you get a good seal. With dual cushion masks, there should be no reason to over tighten the straps. In fact, one of the best features of dual wall cushion masks is that they seal well even when worn loose! Once your mask is properly fitted for your sleeping position, you need to “seat” or inflate the cushion. Pull the mask straight out from your face about an inch or two to let the mask inflate, then gently lay it back down on your face. You may have to repeat this until it feels comfortable on your face, but you will know by feel, when it has inflated and seals. Smile, fall asleep and wake up refreshed several hours later. Click here to buy the Ultra Mirage full face mask. This full face mask has blue gel cushion and silicone flap, that will increase the comfort (from the gel) and improve the seal from the inflated cushion. Click here to buy Respironics Comfort 2 full face mask. If you don't like to use a CPAP mask with a forehead support, then Amara View Full Face Mask can be for you. Are you claustrophobic? Do you have a beard or facial hair? This mask is a minimal contact full face mask designed to prevents red marks, discomfort or skin irritation on the nose bridge. You also have unrestricted view, so you can use your glasses to read a book before going to bed. The downside of eliminating the forehead support is a higher number of strap from the headgear. However, if you don't like having a plastic between your eyes (forehead support) the Amara View mask can give you the quality of sleep that you need. Click here to buy Philips Respironics Amara View full face mask. Please note that if you want to have an effective treatment with CPAP, choosing your CPAP mask is the most important thing. The good candidates for CPAP full face mask are persons with prominent head and facial contours. However, you should also take into consideration the size of your nose, to prevent any irritation of the skin.